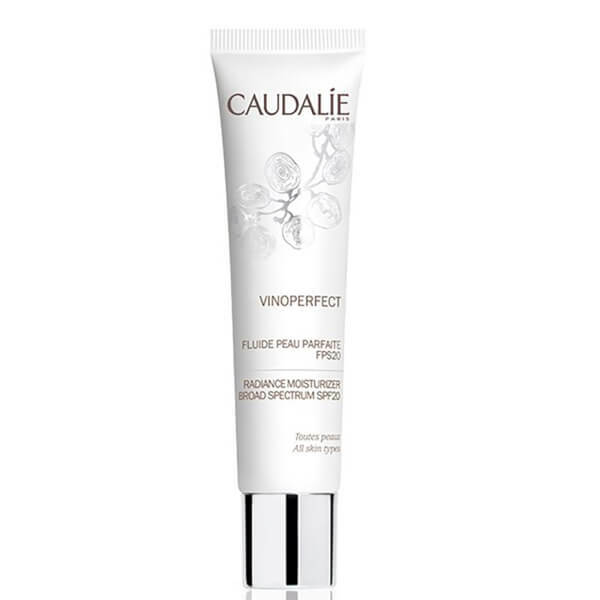 Vinoperfect Radiance Moisturiser Broad Spectrum SPF20 from Caudalie is a lightweight cream that works effectively to reduce the appearance of imperfections, dark spots and blemishes to deliver a healthy-looking, radiant complexion. The oil-free moisturiser provides a light veil of protection to shield skin from damage caused by the sun's harmful UV rays and leave skin hydrated. Suitable for use as a skin primer to remove excess sebum and control oil for an even skin tone. E.N. Apply in the morning to face and neck. Avoid the eye contour area. Aqua (Water), Octocrylene, Heptyl Undecylenate*, Dimethicone, Ethylhexyl Salicylate (Octisalate), Ethylhexyl Methoxycinnamate (Octinoxate), Isoamyl Laurate*, Butyl Methoxydibenzoylmethane (Avobenzone), Methyl Methacrylate Crosspolymer, Squalane*, Glyceryl Stearate Citrate*, Glycerin*, Silica, Butylene Glycol*, Ci 77891 (Titanium Dioxide), Polyglyceryl-3 Stearate*, Ci 77019 (Mica), Parfum (Fragrance), Tocopheryl Acetate*, Bisabolol*, Sodium Polyacrylate, Hydrogenated Lecithin*, Benzyl Alcohol, Palmitoyl Grapevine Shoot Extract*, Caprylyl Glycol, Cassia Angustifolia Seed Polysaccharide*, Alumina, Enantia Chlorantha Bark Extract*, Dehydroacetic Acid, Rhus Semialata Extract*, Sodium Phytate*, Hyaluronic Acid, Papain*, Ci 77491 (Iron Oxides), Carbomer, 1,2-Hexanediol, Bht, Algin, Tocopherol*, Oleanolic Acid*, Limonene, Geraniol, Linalool. (120/184) *Plant Origin.